Tibetans in Kathmandu holding a candle light vigil and prayer session in solidarity with Tibetan self-immolators on February 13, 2013. DHARAMSHALA, February 14: The Tibetan monk who self-immolated in the Nepalese capital Kathmandu yesterday has reportedly passed away. Sources have told Phayul that the monk, who is still not clearly identified, breathed his last at the Tribhuwan University Teaching Hospital at around 10:30 pm (local time) Wednesday night. Doctors at the hospital yesterday confirmed that the monk was in “critical” condition and had received 96 per cent burns. President of the Human Rights Organisation of Nepal, who went inside the hospital and met with doctors treating the Tibetan self-immolator, cited them as saying that the patient was admitted at the hospital at 8:45 am (local time). Doctors had to make an incision in his throat to ease his breathing and gave him painkillers. “They said he was speaking in Tibetan initially and after about 5 minutes it stopped,” Sambhu Lama, a member of the group told Phayul yesterday. 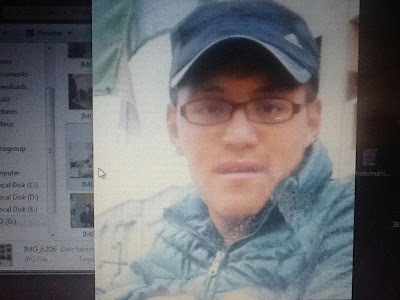 Although the group was not able to verify the name of the Tibetan monk, a Tibetan present at the hospital identified him as Lobsang as against the name used by Nepali police, Dhondup Lotsey. He is believed to be below 30 years of age. 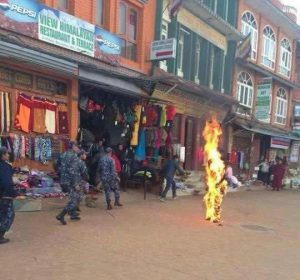 The Tibetan monk set himself on fire protesting Chinese rule in Tibet yesterday at around 8:20 am (local time) near the holy Buddhist stupa of Boudhanath. A police official Keshav Adhikari told AP that the man went inside a cafe, poured gasoline on himself and set himself on fire. The report further quoted a local eyewitness as saying that the monk ran a few steps chanting slogans against China before he collapsed on the ground, engulfed in flames. Security in the entire region has reportedly been tightened following the protest. The self-immolation on February 13 also coincided with the 100 years of the declaration of the “Tibetan Proclamation of Independence” by His Holiness the Great 13th Dalai Lama. A Tibetan monk setting himself on fire near the Baudhanath Stupa in Kathmandu protesting China's occupation of Tibet on February 13, 2013. Wednesday evening, Tibetan residents of the Samdupling Settlement, Jawalakhel Kathmandu gathered for a secret candle light vigil and a prayer session to express solidarity with Tibetan self-immolators. One of the organisers told Phayul that all Tibetans, “from infants to the eldest members of the community,” took part in the vigil despite heavy restrictions from the local authorities. In recent years Nepal has increasingly clamped down on the cultural and political expression of its Tibetan community numbering over 20,000. The country’s increasing dependence on China for financial aid has meant that the freedom of Tibetan refugees have been curtailed. Several Tibetans caught trying to escape Tibet through Nepal have been repatriated in recent years. Sikyong Dr Lobsang Sangay, who is currently in the United States told the Times earlier yesterday that the “occupation of Tibet and repression of Tibetans are the primary reason for the self-immolations inside Tibet." "The solution to the tragedy in Tibet lies with Beijing and my administration is fully committed to dialogue and to address the issue peacefully," Sikyong Sangay said. Since 2009, as many as 100 known Tibetans, living under China’s rule have set themselves on fire demanding freedom and the return of His Holiness the Dalai Lama from exile. 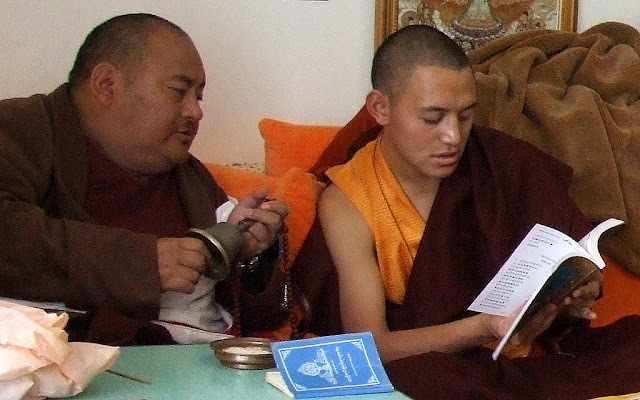 In exile, the Tibetan monk has become the third Tibetan to pass away in a self-immolation protest following Thubten Ngodup in 1998 and Jamphel Yeshi in March 2012. 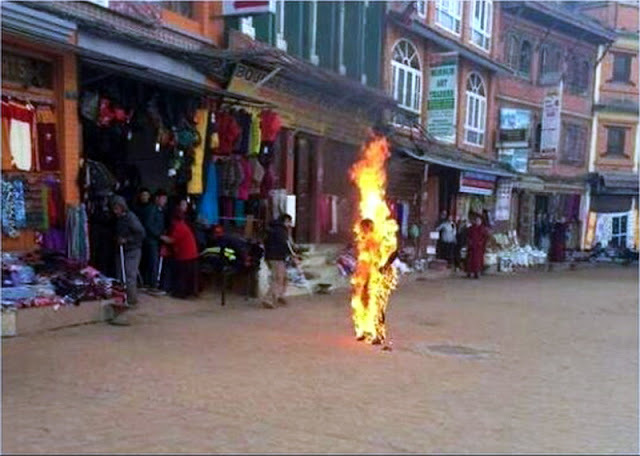 Tibetan self immolator in Nepal identified as Druptse. A Tibetan monk has set himself ablaze on the premises of Boudhanath stupa on Feb 13 in the Nepalese capital protesting China’s rule in Tibet. The Tibetan monk has reportedly wrapped himself with cotton with the help of a metal wire and doused his body in petrol. Nepalese police immediately came to the scene and took him to a hospital where he succumbed to injuries sustained during the self-immolation protest. 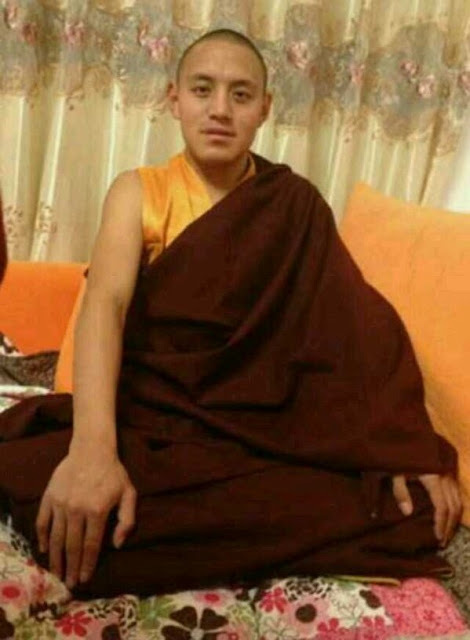 In telephonic conversation on Feb 14, sources from inside Tibet have identified the self-immolator as 25-year-old monk called Druptse (or Drupchen Tsering). Druptse was a native of Gyalchug village in Nupsur Township of Serta County in Kardze Autonomous Prefecture. He had earlier told his friends and relatives that he had not been able to do anything for the Tibetan cause in the past but promised to do something constructive for the Tibetan people in the future. 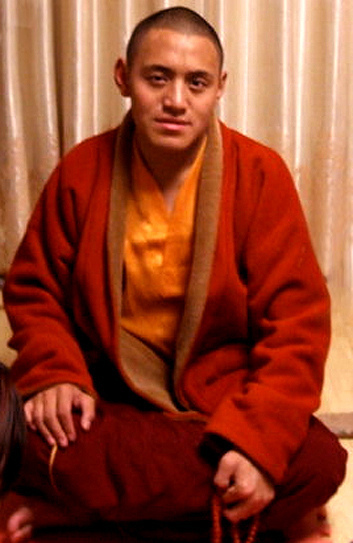 Druptse reached Nepal in January after leaving Tibet and had been staying at the Tibetan reception centre in Kathmandu. Nepalese police has currently not returned his body but are planning to return it to the Tibetan reception centre on Feb 15. Nepalese police has increased restrictions in the Tibetan areas in Nepal following the self-immolation making it difficult for the local Tibetans to gather information about him. 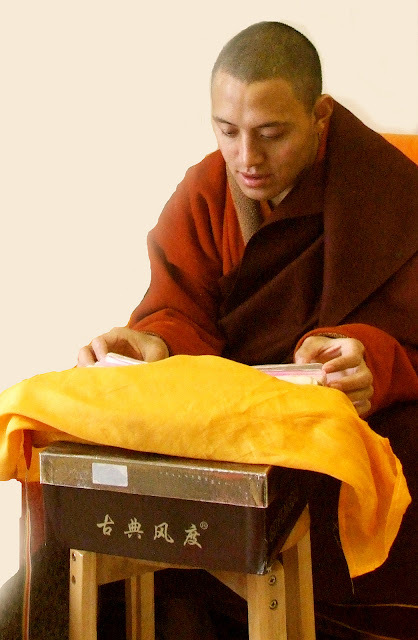 Druptse’s father is a reincarnated lama called Sangnag Tenzin and his mother is Tselha. DHARAMSHALA, February 16: The body of the Tibetan monk who set himself on fire in the Nepalese capital of Kathmandu on February 13 has still not been handed over to Tibetan representatives. Our sources in the city say that Nepalese authorities, acting under the influence of China, have been creating unnecessary obstacles in the process of handing over the body. “This is just like what is happening in China occupied Tibet where the Chinese officials bundle away the bodies of Tibetan self-immolators and carry out cremations in secrecy,” a local Tibetan activist who didn’t want to be named told Phayul. Earlier, the Tibetan monk was identified as Drupchen Tsering (Druptse), a 25-year-old monk native of Gyalchung village in Nupsur town of Serta, eastern Tibet. Druptse recently escaped from Tibet and arrived in Nepal in January this year. He was staying at the Tibetan Reception Centre in Kathmandu since his arrival according to Dharamshala based Tibetan news portal Tibet Express. Banners put in Boudha, Kathmandu. “He had earlier told his friends and relatives that he had not been able to do anything for the Tibetan cause in the past but promised to do something constructive for the Tibetan people in the future,” Tibet Express cited sources in Tibet as saying. Druptse had reportedly wrapped his body with a metal wire and doused his body with gasoline before setting himself ablaze in the morning of February 13 near the holy Boudhanath stupa in the heart of the city. He passed away at around 10:30 pm (local time) same day after suffering 96 per cent burns. Druptse is survived by his mother Tselha and father Sangnag Tenzin, who is a reincarnated lama. Nepalese police have since increased restrictions in Tibetan areas in the city. Further aggravating the situation, banners under the name of “Locals and Youth of Boudha” have appeared near the protest site, warning that such acts will “make life even harder” for Tibetans. “The soul of the victim will rot in hell … You want blood, we give you war,” further reads the banner.